Now, now, as we all know, Hillary made a small fortune day trading in the futures market. Either it’s not such a stupid approach to making money, (She wasn’t even a specialist, and raked it in!) or there was something fishy about how she made it. And we all know THAT couldn’t be! It was all on the up and up, that’s something every Democrat assured me at the time. Peanuts compared to George W. Bush’s “successes” in business. If it is true that she made a small fortune day trading, then she started with a large one. As byomtov notes, suspiciously grand business success for people with whom one may want influence in the future is a bipartisan phenomenon! Yes, I recall reading at the time that it represented a standard way of money laundering, mediated by the broker: He would make two trades, on opposite sides, and assign them after the fact, the one that gained money to the person being paid the bribe, the one that lost money to the person paying it. All day trades, to avoid leaving records which would permit identifying who paid the bribe, and your run of luck would expire once the bribe was paid. Of course she lost her nerve, after a six month uninterrupted spree of winning day trades. It was only a 100K bribe, she knew she’d lose money if she continued beyond that point. 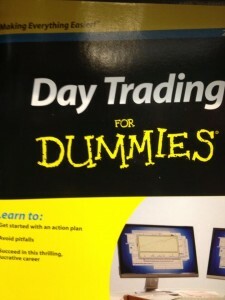 Yeah, day trading IS for dummies, unless you’ve got an ace in the hole, like being laundered money, or inside information. It’s hard to be sure which is the reason members of Congress, (And, yes, of both parties!) are so notoriously successful at it. Probably a combination of the two. Most people have neither. To be fair, the accusations were along that line, though not quite as you as describe. I don’t think it was established. I’d say the evidence is no stronger than that for Mitt having illegally failed to report a Swiss bank account for many years. It is actually possible to make money day trading, just like it’s possible to make money playing professional poker. It takes knowledge, skill and luck in some combination, and the people who are good at it make a lot of money. I traded for more than 3 years, earned a reasonable living at the cost of some portion of my liver and back, and got out. Day trades leave exactly the same records as all trades. They are reported by the clearing company when they post gains to your account. Please check your conspiracy theories at the door. Or at least bring them further into the real world. John – really? Did the three years of your trading career happen to be trading between, say, 2004-2007? I knew some people who thought they were really brilliant, trading around in a rising market. Arbitrageurs? I don’t think most day trading consisrs of arbitrage activity. Maybe you could tell us what the arbitrage opportunities you took advantage of generally looked like. A brett bellmore hijacked thread for dummies. 2008-2011. But it is a common misconception that day traders do best in a rising market, and one that reveals ignorance. Traders actually don’t do that well in a consistently rising OR falling market, that’s where investors do best. Where we shine is in uncertain markets, those with high volatility. Byomtov, Arbs became day traders: same tolerance for risk, willingness to get in and get out, and the core function of hedging is unchanged. All successful day traders that I know , know how to hedge. Now, Brett, you KNOW that’s not so! She entrusted her $1000 to the nice specialists at Tysons, who invested it FOR her. And they had a remarkable run of luck. Made it into $100,000. The fact that Tyson’s wanted things from her husband was only a co-inky-dink, I am sure. A few nights ago I saw an 1887 play “The Henrietta”, about Wall Street Manipulation. The main character decides that his younger son, Bertie, is a good-for-nothing, gives him a parting gift and tells him that he is now on his own. The son believes that he understands trading; he utters a random number and a random set of letters. After the broker matches the random letters to an existing company and asks Bertie “Buy or Sell?”, Bertie flips a coin. Bertie becomes “The Young Napoleon of Wall Street”, acquires a fortune, wins the respect of his father and the hand of his beloved. So my problem was that Bertie’s actions did not strike me as comic but as perfectly sensible. I do not know what the view was in 1887? – Index funds. The only investment that normal people will ever need. – Term life. Other forms of life have investment features: almost all inferior to index funds plus term life. – Immediate annuities, to be purchased at retirement. – Checking account. Maybe bank CDs. – Credit card, only if you pay in full every month. Otherwise, a debit card linked to the checking account. – Auto & home insurance, with an umbrella at least equal to your net worth. – Mortgage and maybe educational loans. Auto loans aren’t too unfairly priced if you get them from a bank, but if you take one out, you’re at risk of buying more car than you need. – Fee-based financial advice. Maybe. – Individual stocks, day trading or moonlight. Double true for commodities. – Timeshares. Anything else called “real estate” that you can’t explain to your 10-year-old. – Muni bonds even in fund form, unless you have enough money to hire a financial adviser. – Any product sold by a bank, except for loans and payment-related products (see above). Any product sold by a stock or commodities broker. (Buy mutual funds directly.) Any product sold by an insurance agent. Buyers are less likely to be ripped off than people who are sold to. – Credit counseling. I’m sure that there are some good credit counselors, but most of them favor creditors, not you. Don’t be fooled by the nonprofit status. A personal bankruptcy lawyer might be a better idea, although they’ll demand a fee, of course. Oh, to change the topic a bit: Nice trolling, Brett. Hey Ebs – what about me? I admit Brett started it, but I did chime in vigorously. Am I chopped liver, or what??? You’re not chopped liver, Dave, but you are second banana. No big disagreement. I’d add managed mutual funds (as opposed to index funds) to your list of no-nos. Also, any kind of land unless you have a specific, sensible, plan to use it for some purpose, like building a lake cabin or something. Never as an investment. I’d also avoid medium or low-grade bonds. They pay that extra interest for a reason. And don’t put your 401(k) money in employer stock. That’s anti-diversification. I think you should have disability insurance. Most people’s prime asset is their ability to earn a living. Lose that and you are in trouble. Good call on disability. I forgot it because it comes along with my job. But that’s not true for lots of people. I also agree with you on land; you put it better than my “ten-year-old-could-understand-it” test. I’ll note that, as I left college, I purchased a whole life policy, with a minimum guaranteed interest rate on it of nine percent. (Bought it at the peak of the 80’s inflation.) Figured I’d been pretty smart, no way was inflation staying that high for long. I was right. Pretty soon I was getting an after inflation rate of return of 5-6%, and was dumping all my discretionary income into that policy. Looked like I was going to be able to retire early, because I’d bet right, and they’d bet wrong. What I wasn’t smart enough to anticipate was that American General would go to court, and get a judge to overturn the contracts, so they could float the rate down to something where they weren’t losing money… and I wasn’t really making it anymore. My very first brush with crony ‘capitalism’. Didn’t, however, sour me on capitalism. It soured me on crony, and on government willing to toss the rule of law aside to benefit the powerful. So, you’re saying it didnt sour you on the fictional capitalism that exists only in your imagination, just on the capitalism that exists in the real world. Welcome, comrade! The crony component of capitalism is growing, as the government is growing, and as the government liking you, or at least being paid off to not actively dislike you, becomes more and more important. This is to the net detriment of society, because one thing crony capitalism is not, is particularly productive. Unfortunately, a growing crony component to capitalism is the the benefit of everyone in government, and it’s up to government whether it grows. But it is not the entirety, not by a long shot. You’ll know when it is, because you’ll be starving. Funny. I see plenty of crony capitalism on the increase because of the *ensmallening* of government. Such as the growth of the prison industrial complex, which is a great example of how typcial Republican-driven privatization of public functions not only results in crony capitalism, but also directly threatens civil liberties, and makes fascism in our time more likely. I wouldn’t call outsourcing prisons shrinking government. I’d call reducing the number of things that are illegal reducing government. I got a good lesson in â€œcrony capitalismâ€ years ago when I purchased some land that I intended to develop sometime in the future. Very few banks would lend money on raw land but, because I had a good credit rating, and income, I found one that did. Dutifully paying my monthly fee for several years I was stunned one day when I received a letter from a strange bank informing me that they had bought my existing bank. They went on to say that, since they did not issue loans on raw land, my existing mortgage was being voided and that my loan would have to be paid in fullâ€¦â€¦..within 2 weeks, or foreclosure proceedings would commence. I couldnâ€™t believe what I was reading. They canâ€™t do this! We have a contract; I have abided by that contract faithfully. Surely, they meant they would â€œgrandfatherâ€ in existing loans and, were simply stating what their future policy would be. And, surely, I would be wrong. They not only could, they did. Long story short, I made other arrangements and is well. But, the feeling I had and, the bitter taste left in my mouth, has remained ever since. Arenâ€™t there laws protecting us from actions like these? Donâ€™t we have representatives, donâ€™t we have banking committees? The answer I got was, â€œyes, we have representatives and, yes, we have committees.â€ And, the banks own them both. I don’t know as much about insurance as I do about other financial services, but there’s a good chance the judge was playing it straight, and so was the law. If the insurer wrote too many risky products, it might have been insolvent, or next best thing, and incapable of paying all of the claims as they emerged. It therefore needed to go through something that resembled Chapter 11 reorganization, although the Bankruptcy Code doesn’t apply to insurers. This means that policy claims must get adjusted downward. If you think that the result is somehow wrong, you must support bailouts. There ain’t no third way. But your story is a good example of the point I was trying to make: avoid annuities. Not only are they poorly-priced: you bear the risk of insurer insolvency. There is no such risk with index funds. Which reminds me of another point. There is something like FDIC insurance for insurance products, but it is pretty crappy, and is limited to $300K in most states. (States do vary: beware!) This means that you are at risk with home and liability insurance. It’s possible to avoid the risk with life products, by buying insurance from several companies. They usually give a bulk discount, on the other hand. Mr S: bear in mind that “401k” is not an investment, it’s a way of funding an investment; key elements being the possible employer match, and the tax-free increase in value. You still have to decide what to do with it, and a plan should allow you to put it all into an index fund or something close to it. Traditional arbitrage would, almost by definition, actually be considered the classic day trade. True. Arbitrageurs are day traders, but that doesn’t make day traders arbitrageurs. All men are mortal. So are all zebras. OK, I have a question about this. There’s supposed to be this “wisdom of markets” thing, right? We’re supposed to believe that Apple stock goes up when traders think about Apple’s corporate health and make judgements about its profitability. We’re supposed to believe that Kodak stock goes down when someone does a study of the digital vs. print film markets and bets against film. And we’re supposed to believe that stocks are priced “correctly” because of the distributed wisdom of these judgements. In a world where *everybody* is buying unmanaged funds, does the wisdom of markets still mean anything? What force actually makes stock prices rise and fall, if the entire idea of “researching individual stocks” is deemed a waste of effort? Without *some* informed research-based traders, isn’t everyone just speculating on (and amplifying) the same meaningless noise? This is an extremely useful idea, and one which will likely not get the attention it deserves, having been posted at the end of a long discussion largely about Hillary’s remarkable good fortune. I think you are right, those of us who put money into index funds are parasiting on the analytical work of people who actually do think about the health of companies and their long term prospects. Probably the answer is, there are some real analysts and their work, even though it doesn’t feed into very many transactions, is enough to send signals to everyone in the unmanaged part of the business. Warren Buffet and Charlie Munger, thank you for the free information you are providing for me. Berkshire investors have made a good amount by getting their insights a little quicker than the rest of us, maybe that’s enough. Mike O’Hare has written in this blog about the problems of providing feedback and rewards to cultural providers when the actual consumption of their work is free. Give people money based on the number of times their songs are called for in Pandora? THAT would lead to some creative programming, spam requests for songs coming out of Moldova… When Netherlands was awash in cash from natural gas, they started buying any art which Dutch wannabe artists were producing. A LOT of crap art got produced, and put into government warehouses. Hard problem, but I think Berkshire has mostly solved it for us in the financial world. dave schutz says: This is an extremely useful idea, and one which will likely not get the attention it deserves, having been posted at the end of a long discussion largely about Hillaryâ€™s remarkable good fortune. A digression that you not merely encouraged and contributed to, but that you actively sought credit for accomplishing. Now you’re sighing over the fact that your own trolling might be distracting readers’ attention from “an extremely useful idea [that] will likely not get the attention it deserves…”? Sheesh. I love day trading. I don’t actually DO it, but the existance of it means plentiful data for my little machine learners to crunch on. Plus, it’s pretty straightforward on the fail/success criteria (“Did I end the day/week/period with more money than I started”), so from a data mining/machine learning perspective, you get tons and tons of really cheap, complete data with simple and easily understood basic success criteria. Which makes it a great, great field to toy around with. As long as you’re not risking actual money! Of course, the actual results might make you blanch. My little minions might make serious bank over the training set, but less than 1 in 50 turn a profit on the isolated test set. And I suspect that they’d do even more poorly in the last five or so years, as algorithmic trading became prolific. How much longer before financial trading is delegated entirely to AIs? It isn’t day trading any more, it’s minute trading. More milliseconds in a minute than seconds in a trading day. Which means that even if a day trader spots a trend and is right about its implications the HFT bots will be there first and scoop up most of the profit. Long ago there was a science fiction story (Vinge, True Names) that had one character who was a human-level AI, but because of CPU constraints operated on a generally much slower time scale than the people around it. As far as the subset of intelligence that involves securities trading goes, the CPU constraints are now very much the other way. When I started to see trades going south in a matter of 20-30 seconds after order entry, I realized what I was up against and got out. Morato20, anyone can make money on a trading set, because you build your assumptions into the method. Trading in real time is a whole ‘nother story. Um, no. Data mining would be quite pointless if that was the case. Yes, you should make money on a training set — you iterate through a solution space looking for models that do! The test set, however, is different. You do not iterate through that. You take your best ‘trained’ solutions and test them on independent, “never before seen” data and see how they do. That’s how machine learners work. You give them some data, let them look for patterns and predictive methods, then take the best results and run it against an independent set and see how they do. You NEVER go backwards (never let independent test results color or affect training results). Fake trading was just an easy way to test this.